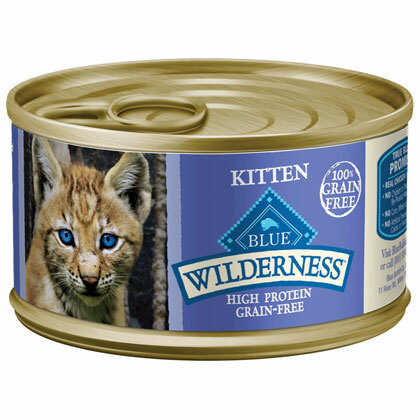 What is Blue Buffalo Wilderness Canned Kitten Food? Blue Buffalo Wilderness Canned Kitten Food is a high-protein food that will provide your kitten with a higher concentration of the chicken all growing kittens love and need. Created without wheat, corn, soy, preservatives, or by-products, Blue Buffalo Wilderness Canned Kitten Food contains the protein and other nutrients to make your kitten grow up healthy and strong. Blue Buffalo Wilderness Canned Kitten Food is a high-protein cat food that gives your kitten all the nutrients needed to grow up healthy and strong. These nutrients include fiber, taurine, DHA, calcium, phosphorus, and other vitamins needed to help your kitten develop into a healthy adult cat. Do not feed your kitten more than the recommended amount. Doing so can make your kitten overweight. Open one can of Blue Buffalo Wilderness Canned Kitten Food. Look at the recommend serving size for your kitten's age and weight. Place the recommended amount of food in your kitten's dish. Place the unused food in a clean container and refrigerate. Don't forget to adjust the servings as your kitten grows. Keep a fresh bowl of clean water near the food to ensure that your kitten stays properly hydrated. Ingredients: Chicken, Chicken Broth, Salmon Oil (source of DHA-Docosahexaenoic Acid), Natural Flavor, Flaxseed Meal (source of Omega 3 Fatty Acids), Potassium Chloride, Taurine, Choline Chloride, Guar Gum, Carrageenan, Cassia Gum, Potatoes, Vitamin A Supplement, Thiamine Mononitrate (Vitamin B1), Riboflavin (Vitamin B2), Niacin (Vitamin B3), d-Calcium Pantothenate (Vitamin B5), Pyridoxine Hydrochloride (Vitamin B6), Biotin (Vitamin B7), Folic Acid (Vitamin B9), Vitamin B12 Supplement, Vitamin D3 Supplement, Vitamin E Supplement, Iron Amino Acid Chelate, Zinc Amino Acid Chelate, Cobalt Amino Acid Chelate, Copper Amino Acid Chelate, Manganese Amino Acid Chelate, Sodium Selenite, Potassium Iodide. Nutrition Statement:BLUE Wilderness Chicken Food for Kittens is formulated to meet the nutritional levels established by the AAFCO Cat Food Nutrient Profiles for maintenance. Place unused portions in sealed containers and refrigerate. Unopened cans should be stored in a dry place.